but my submissions are not telling me what time they chose. I need that for record keeping. 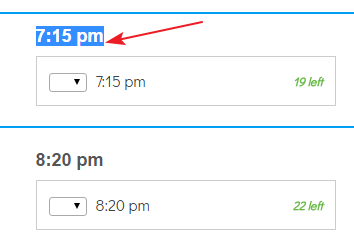 I'd also love the auto response to tell them what time they chose. Can you help me? What I suggest you do is create a new Autoresponder Email on your form. This should update the content of your form Email. This label can be hidden on the form by injecting the CSS code below to the form. Let me also forward a feature request to our backend team to see if it is possible to display the description in the email notifications for the widget. I cannot provide you any ETA at this moment. However, if there is any information in this regard, we'll update you here. Hi, Inventory widget is a single item only. It's not really necessary to add the label of the selected item. Question Label will help identifying it. But if you really want to display the selected items in one single question. Consider using the Gift Registry widget, it's a singlet selection per entry, if you want multiple items to be selected per entry try Quantity Gift Registry. The name could be a bit misleading depends on what you were trying to show. But it will do the job. Please let us know how that turns out for you.